More snow is counterintuitively also an indication of climate change. During warmer months, this can cause record-breaking floods. But during the winter – when our part of the world is tipped away from the sun – temperatures drop, and instead of downpours we can get massive winter storms. Across the U.S., winter isn't as brutal as it used to be. Researchers have found that the pace of winter warming has picked up in recent decades. Between 1970 and 2017, winter in the mainland U.S. warmed more than four-and-a-half times faster per decade than over the past 100 years. In the past few decades, we've seen global temperature averages go up. Way up. A cold front may bring a welcome change to sweltering summers, but overall, our planet is experiencing a dramatic warming trend. According to NOAA and NASA, 2016 shattered records as the warmest year across global land and ocean surfaces since record-keeping began in 1880.3 This is a pattern that goes back decades. 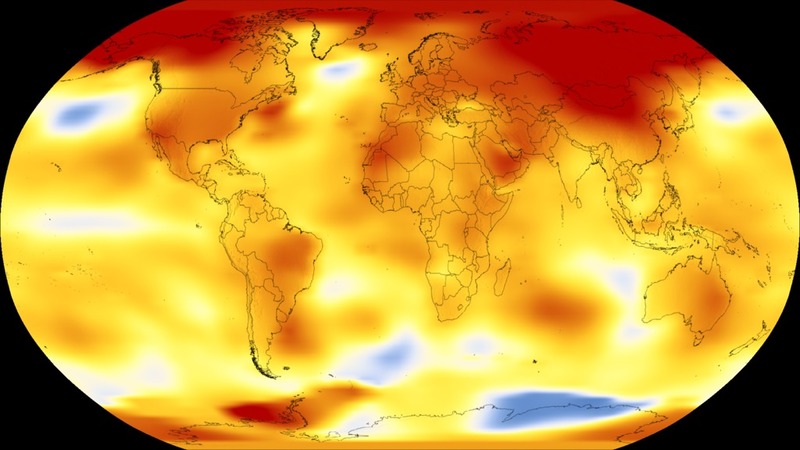 A NASA analysis shows Earth’s average temperature from 2013 to 2017, compared to a baseline average from 1951 to 1980. Yellows, oranges and reds show regions warmer than the baseline. The polar vortex is potentially a sign of climate change, though the consensus is still out. While it is still too early for scientists to reach a consensus about this plausible link, it is thought that melting sea ice in the Arctic can weaken the jet stream, allowing for frigid polar air to penetrate farther south than normal. Action is needed now to avoid the most catastrophic effects of climate change. The science is clear: Human activity is causing our climate to change, including winter weather. What we need to do now is demand climate action – from leaders at every level – while urging companies to adopt sustainable business practices. National Climate Assessment, "Heavy downpours increasing"
Climate Central, "Here’s where winters are warming the most"
Wiley Interdisciplinary Reviews, "Amplified Arctic warming and mid‐latitude weather: New perspectives on emerging connections"